Situated East of Mattishall on Stone Road. The book THE HISTORY OF THE UNITED REFORMED CHURCH MATTISHALL NORFOLK is available from the Mid Norfolk Family History Society. The old building still stands but is now used as a barn . The meeting house was opened on the 4th August 1772 and John Carter [the first minister] was ordained there on 30th September 1772. In its 184 years many local families are on record as meeting and worshiping there. 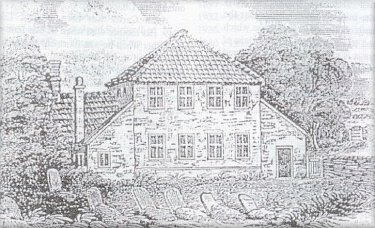 The Old Moor Meeting House with its burial ground was sold in 1956. 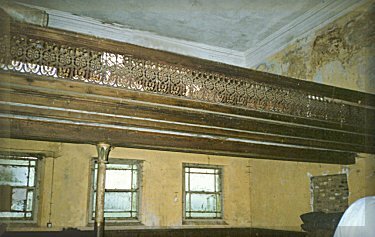 The congregation and most of the removable furnishings, including the wall memorial plaques were transferred to Welgate Chapel [United Reformed Church]. A view inside today, notice the ornate gallery which is still a dominant feature. THIS second article turns to Mid Norfolk for evidence of the fruits of the labours of Thomas Taylor, the 17th Century Congregational minister born at Scarning. When the foundation stone of the Cowper Congregational Church, East Dereham, was laid in 1873, the trials and tribulations of this brave pioneer were not forgotten. His efforts at Dereham and Mattishall for the faith on which he staked his very life were recalled, the minister referring to him as "the man to whom the commencement of this church is due." At the best the Dereham Congregationalists or Independents of Taylor's day – a mere handful of them - met secretly in some old barn or humble dwelling house well off the beaten track. Church and State hated them like the plague, and the threat of persecution was ever at their doors. Despised and rejected, they were in every sense outcasts for their faith. For the next hundred years practically nothing is known of Congregationalism in the town, but it can be said that there was little in it. Indeed, there were probably times when its flickering light seemed as good as out. In 1779 the Rev. John Carter, Mattishall’s first Congregational minister, went into Dereham to preach to the people, who were extremely hostile. He did, however, find a few stalwarts prepared to follow him. Maybe they were descendants of those who had listened to Taylor, and the faith had never left their households. After a time regular services were held in a barn, and though Dereham showed some resentment at this intrusion the mission flourished. By 1812 so much progress had been made that it was decided to build a chapel in London road, then known as Swan Lane. The site was well away from the centre of the town, as was essential in order not to cause offence to the leading citizens. For an early 19th century Nonconformist chapel this was a fairly ambitious building, and some few years later it was much enlarged and the ugly gallery common to that period added. This chapel can still be seen, and is now serving as a British Restaurant. The next landmark in Dereham Congregational history was the building of the Cowper Church, at the laying of the foundation stone of which the congregation heard the following interesting review "This denomination of Nonconformists has increased so greatly during the last few years that their small, dingy chapel in Swan Lane, built in days when Non-conformity was not treated with that respect it is now, no longer affords them sufficient sitting accommodation. Nothing but a new church would give the congregation the accommodation required. The position of the old church in an out-of-the-way back street somewhat represented that phase of Nonconformist history which has not long since closed, the period when Nonconformists were subjected to laws which kept them from prominent posts in the kingdom. The new site will equally well represent the new phase in their history, the period which has witnessed the abrogation of those laws, for this site is in the Market Place and will be in close proximity to other public buildings. What adds interest to the church is that it will occupy the site on which stood the house where William. Cowper, the author of "The Task." spent his last days - a poet whose works breathe much of the spirit which has animated Nonconformity." Incidentally there was considerable opposition to the building of this new church, but not on those harsh religious grounds which Taylor experienced. Many people naturally resented the demolition of Cowper's historic house but the Congregationalists eased the storm by deciding to name their building the Cowper Memorial Church, and. by the by, this allowed them to make an appeal for funds to a much wider circle. At Mattishall the faith which Taylor had pioneered endured through the worst oppressions of Charles II's reign, but it was the sorely tried faith of which martyrs are made. Nonconformists, in general, were regarded as fomenters of conspiracies and insurrections. If, said the Conventicle Act of 1684, five persons are found, in addition to the resident family, at any religious service other than that of the State Church they are to be thrown into gaol Persons allowing their houses to be used for illegal services were subject to the most dire penalties. Early in the 18th century, and maybe a little before that, there was a congregation of Dissenters at Mattishall, and it appears that a chapel was built there around that time. Numbers were extremely small, and in 1744 or the year after the congregation was dissolved following many vicissitudes. Almost 15 years later the chapel was pulled down. This early village centre of Nonconformity did not, however, break with its traditions for any length of time. In 1770 the man who had bought the old chapel and demolished it gave the site and £20 for a new church, and the next year the famous Old Moor Chapel, which is still to be seen was erected. 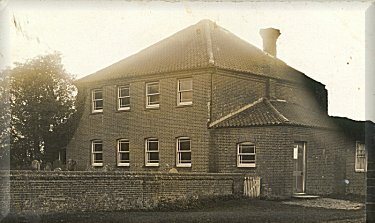 Carter's ministry proved so successful that after a few years the chapel had to be considerably enlarged, and Congregationalists from every part of the county came to regard it as a Mecca At the building of the chapel in Swan Lane, Dereham, Carter went to live in the town while continuing to minister at Mattishall. Persecution was by no means over, however and the Rev T W Wilson, who became a minister of the Old Moor Chapel in 1821, met with almost as much hatred as Taylor had done in the 17th century. Records show that when Wilson went into the neighbouring Mid-Norfolk villages to preach he was set upon with sticks and stones on numerous occasions, and more than once his enemies shot at him. Under this strain his health gave way, and he was obliged to retire, though, fortunately, he recovered sufficiently to allow him to take up the pastorate again in 1828. In the 19th century this congregation time and again were to the fore in fighting for Dissenters' rights. There was, for example the case of Mr. Jonathan Hatton*, a member, who was in 1867 prosecuted for non-payment of the Church rate. He defended the suit, lost it, and was utterly ruined. But the Norwich Committee of the Liberation Society came to his aid, resolving that the case was one "entitled to the sympathy and help of the friends of religious liberty in Norwich and elsewhere, and that a request be made to the Nonconformist congregations in the county to render assistance in this matter by public collections." Much could be added of the growth of Congregationalism in other centres where Taylor laboured, of how his magnetic influence can be traced a century or two after his death, but enough has been said to show the calibre of the man, and to emphasise what a debt of gratitude Nonconformists owe to his unflinching courage and independence of outlook and to those of like qualities. Today the Congregational Church and, indeed, all Nonconformists have nothing to fear from anyone. and sometimes they may appear to the man in the street to have forgotten the bitter struggle, of their forefathers, and to have divorced themselves from all which might be considered revolutionary Whether or not an entire absence of persecution has strengthened Nonconformity is not for me to say, but some have held that persecution makes both the cause and the man.